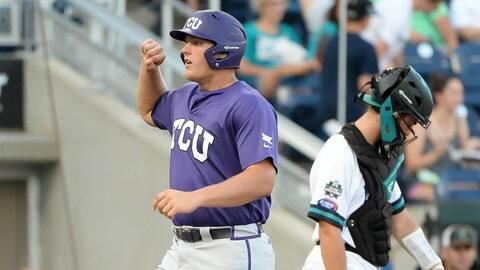 Luken Baker celebrates after hitting a home run in 2016. After signing third baseman Nolan Gorman, their top pick in the 2018 draft, on Monday, the St. Louis Cardinals announced they have signed the three players who were selected after Gorman: pitcher Griffin Roberts, first baseman Luken Baker and shortstop Mateo Gil. Roberts, Baker and Gil signed their professional contracts Wednesday at Busch Stadium. Roberts, 21, was the team’s Competitive Balance Round A pick out of Wake Forest. Baker, 21, was a second-round compensatory pick out of Texas Christian. Gil, 17, was a third-round pick from Timber Creek High School in Texas.